If we have just made our lovely blog, you might be wondering how can our blog listed on search engines. We can get listed our blog on Google search for free if we help Google find our blog. To do that, you must know about Google Search Console (formerly known as Google Webmaster Tools). Search Console is a free tool offered by Google that helps you to list our blog in Google search results. This tool also helps to increase the crawl rate of your blog. All you have to do is a few simple things. First of all, you must verify in Google Search Console that you are the owner of the website, but don't worry because google search console will automatically verify our blogger blog if we use same google account on both. 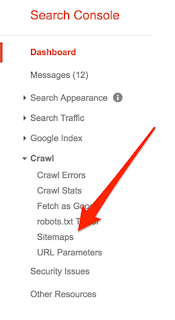 And, the second and most important task is to send your blog / website sitemap to the search console. Here, the guide through the step-by-step method of sending a website map to Google's webmaster tools. Step 1: Sign in to Google Webmasters with our Blogspot Account. After we done submitting a sitemap, our blog will not immediately be indexed on the google search engine, uncrawled sitemap will be stated as 'Pending'. There is no specified timeframe in which Google, or any search engine, will start to show more of our URL's. The initial crawl alone will take up to several days. The problem is that the algorithms may not always deem all of our sitemap pages worthy of being listed. You can try resubmitting your XML sitemap a few times.